Perfect for evening wear, this black pearl bracelet makes an excellent alternative to its classic white pearl counterpart. 6-7 mm freshwater cultured black pearls are double knotted along this strand bracelet, finished with a filigree box clasp crafted in 14K gold. Piece measures 7 1/4 inches in length. Style #: LB6199BLYG Classic Pearl Bracelet 6-7 mm Freshwater Cultured Black Pearls 14K Gold Measures 7 1/4 Inches in Length . GORGEOUS RARE GENUINE SALTWATER TAHITIAN SOUTH SEA PEARLS! 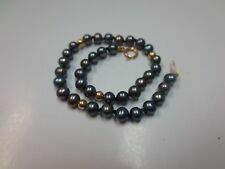 100 % REAL SALTWATER TAHITIAN SOUTH SEA PEARL AND REAL GOLD! The bracelet is finished with YELLOW GOLD FILIGREE CLASP. PEARL: Tahitian South Sea pearl. With a design simple enough to wear over and over again, this bracelet is the perfect addition to you jewelry collection. Includes gift box. 7.5-8.5mm Cultured Freshwater Pearl And Black Onyx 14kt Yellow Gold Bead Bracelet, 7.5'. #BN145 NEW 14K Solid Yellow Gold black freshwater 8mm Pearl Bracelet 8.5"
NEW 14K Solid Yellow Gold black Freshwater Cultured Pearl & Bead Tin Cup Bracelet 8.5". 14K Yellow Gold Figaro Link Chain. Pearl Quality: Genuine Natural Fresh Water black Pearls. Pearl Shape: Round. From United StatesMetal: Yellow GoldStyle: BeadedLength: 8.5 - 8.99"
This is a 14k Gold Filigree Clasp & Beads Black Onyx & Pearl Bracelet. The black onyx beads are hand knotted. This is a very fine quality bracelet. The bracelet is in excellent conditon. The clasp is in good working order. Q: Can I get my necklace or bracelet in. Q: I want to change another clasp, is it OK?. necklace long: 7.5-8'. Color: black. a longer or shorter length?. Reasonable Prices and Best Service. 100% real genuine pearls. From ChinaMetal: Yellow GoldStyle: BeadedLength: 7.5 - 7.99"
You'll get as pictured one strand black peacock pearl beads bracelet with 14K yellow gold clasp & 4 pieces 14K beads. Marking: 585 and tested 14K both clasp and beads. Pearl Size: Average 4 mm. Nice luster and lacquer, minor blemishes barely visible when looking closely. Pearl colors are blue/green, black and shades of mocha. 14k Multi Colored Peacock Pearl and Gold Spacer Bracelet. Gold spacers: there are a a total of three spacer bars in the bracelet. 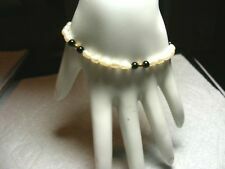 Estate find 14k yellow gold freshwater pearl and black onyx bracelet.marked: 14k. 7" long.3.9 grams.5 14k gold ball spacers.14k gold clasp.6 black onyx beads. 22 white pearls.gold has been tested. 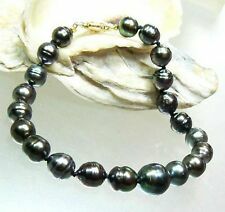 Freshwater Black Pearl Bracelet. Shape of Pearl = Round. Color of Pearl = Black. Weighs 8.9 grams. This is an out of pawn item. 100 % REAL SALTWATER TAHITIAN SOUTH SEA PEARL AND REAL GOLD! The bracelet is finished with YELLOW GOLD FILIGREE CLASP. GORGEOUS RARE GENUINE TAHITIAN SOUTH SEA PEARLS! PEARL: Tahitian South Sea pearl. #BN178 NEW 14K Solid Yellow Gold Faceted Onyx Black Bracelet 7.5"
Bead Quality: Natural Faceted Onyx Black Bead. 14K Yellow Gold Figaro Link Chain. Bead Shape: Round. Metal: Yellow GoldStyle: BeadedLength: 7.5 - 7.99"